Following the publication of the paper 'Loss of Parp-1 affects gene expression profile in a genome-wide manner in ES cells and liver cells' , we found an error in our data. In the article, we used six replicates of microarray data of wild-type ES cells for comparison with the microarray data of Parp-1 knockout ES cells. We found that three replicate data were carelessly included in the data for wild-type ES cells. The comparison should have been carried out between three replicates for the Parp-1+/+ ES cell line, J1, and three replicates for two Parp-1-/- ES cell lines, 210–58 and 226–47, respectively. Therefore, we re-analyzed the data in ES cells according to the same criteria. The consequences of this error are reflected in changes to our results although the conclusions we obtained in the study are not affected. Here, we demonstrate that of the 9,640 genes analyzed, in Parp-1 -/- ES cells. 3.6% showed altered gene expression. Of these, 2.5% and 1.1% of the genes were down- or up-regulated by 2-fold or greater, respectively, compared with Parp-1+/+ ES cells (p < 0.05). A comparison of the basal gene expression profiles in Parp-1 -/- EScells to their wild-type (Parp-1 +/+ ) counterparts, is presented in Fig. 1A &1B (corrected) and Table 1 (corrected). We found the expression of (344/9,640) genes, namely 3.6%, was different by at least 2-fold between Parp-1 -/- and Parp-1 +/+ ES cells (p < 0.05) (Fig. 1B (corrected) and Table 1 (corrected)). Notably, a larger fraction of the genes, being 2.5%(238/9,640), was down-regulated, whereas only 1.1% (106/9,640) of the genes were up-regulated (see Table 1 (corrected)). bThese genes were presented in Fig. 1.
cParp-1+/+ ES cell clone, J1, and Parp-1-/- ES cell clones, 210–58 and 226–47, were used. dTwo mice were used for each genotype. eThree EFs obtained from three embryos were analyzed as triplicate experiments. Effect of Parp-1 deficiency on gene expression. Gene expression data from microarray analyses are plotted for Parp-1 -/- versus wild-type (Parp-1 +/+ ) ES cell lines (A) & (B). Horizontal and vertical axes represent expression levels normalized for an individual gene. Each point represents normalized expression data for an individual gene. The genes that showed standard deviation greater than 2.0 in the normalized data of both genotypes (A) were excluded and gene lists were constructed with p < 0.05 (B). Fig. 1D–F in the original article  remains unchanged and is presented as (C) – (E), respectively. We also made the heatmaps using the gene lists containing the 893 genes that showed a difference at p < 0.05 in ES cells (Fig. 2A (corrected)). Although we used independently isolated Parp-1 -/- ES cell clones, a clear and common alteration in the gene expression profile was observed (see Fig. 2A (corrected), and Tables 2 (corrected) and 3 (corrected)). Comparison of gene expression profiles among cell lines or cell types. Heatmaps of gene expression profiles in ES cells (A). We constructed the heatmaps using the gene lists containing the genes that showed a difference at p < 0.05 in ES cells. Each heatmap is constructed using GeneSpring GX ver. 7.3.1. Numbers of genes down-(C) or up-(D) regulated in common between Parp-1 -/- ES cells and livers. The numbers of the genes are indicated in Venn diagrams. These genes showed the difference with at least 2-fold between Parp-1 +/+ and Parp-1 -/- (p < 0.05). Fig. 2B in the original article  remains unchanged and is presented as (B). Fig. 2D & F in the original article  are removed and Fig. 2C & E were corrected in the original article  and are presented as (C) and (D). a)W, wild-type cells (J1); H, Parp-1-/- ES cells (210–58 and 226–47). a)H, Parp-1-/- ES cells (210–58 and 226–47); W, wild-type cells (J1). We further selected the genes that showed relatively high expression levels (the "Flag value" in GeneSpring ver. 6.1 of the genes should be either "Present" (high level of expression) or "Marginal" (moderate level of expression) in all replicates of the genotype within the 893 genes that showed a difference at p < 0.05, see Table 1 (corrected)). Among the 85 genes selected by this analysis, there were 61 genes, obviously including the Parp-1 (Adprt1) gene itself, that were down-regulated and 24 genes up-regulated, as listed in Tables 2 (corrected) and 3 (corrected). In the livers, 3.3% (411/12,353) of genes showed a significant difference in expression level (p < 0.05) between the Parp-1 genotypes. In the livers of Parp-1 -/- mice, 2.0% (253/12,353) of the genes were down-regulated and 1.3% (158/12,353) of the genes were up-regulated (p < 0.05). Similar to Parp-1 -/- ES cells, a higher percentage of the genes, 62% (253/411), were down-regulated and the remaining 38% were up-regulated (Fig. 1C–E in the original article , and Table 1 (corrected)). The expression of representative marker genes of the liver, including albumin (Alb1) and phosphoenolpyruvate carboxykinase (Pepck), was similarly high in both Parp-1 genotypes. The heatmaps were constructed using the gene lists containing the 641 genes that showed a difference at p < 0.01 in livers (Fig. 2B). Parp-1 deficiency commonly altered gene expression profiles in the livers of two mice analyzed (Fig. 2B, and Table 4 in the original article ). 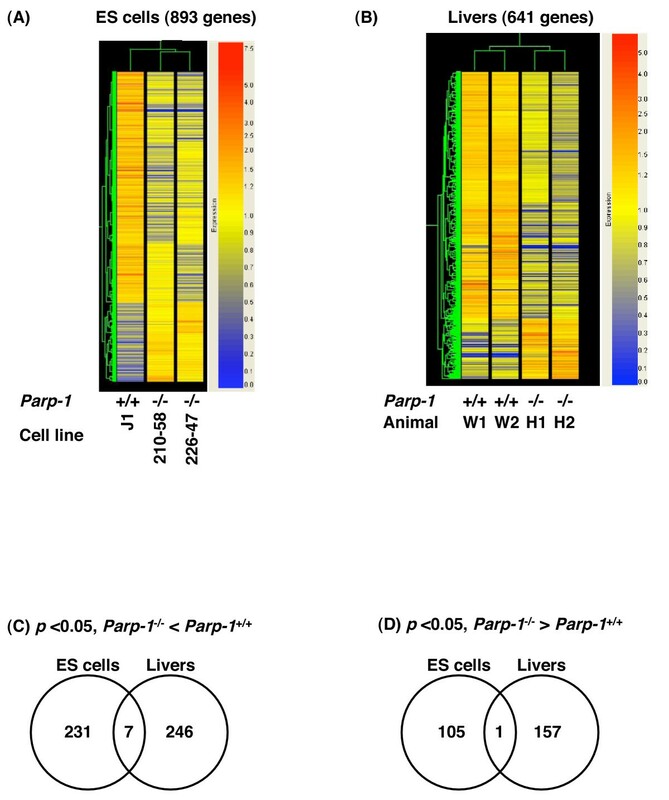 We compared gene expression profiles between Parp-1-/- ES cells and the livers. There were no genes commonly up- or down-regulated as summarized in Tables 2 (corrected), 3 (corrected), and 4 in the original article , namely in the genes showing relatively high expression levels selected by Flag values, although we observed that 7 genes, including Eif2s2 (eukaryotic translation initiation factor 2 subunit 2 beta), Parp-1, and 1 gene Crygs (crystallin gamma S), were commonly down- and up-regulated in the ES cells and livers (p < 0.05), respectively (Fig. 2C (corrected) &2D (corrected)). Data analysis was performed with the GeneSpring® software ver. 6.1 and ver. 7.3.1 (the latest version). For statistical analyses, the fluorescence intensity (raw signal) was normalized to the 50th percentile reading per chip, and then normalized to the median reading per gene. We performed the non-parametric tests with the cross-gene error model being inactive. 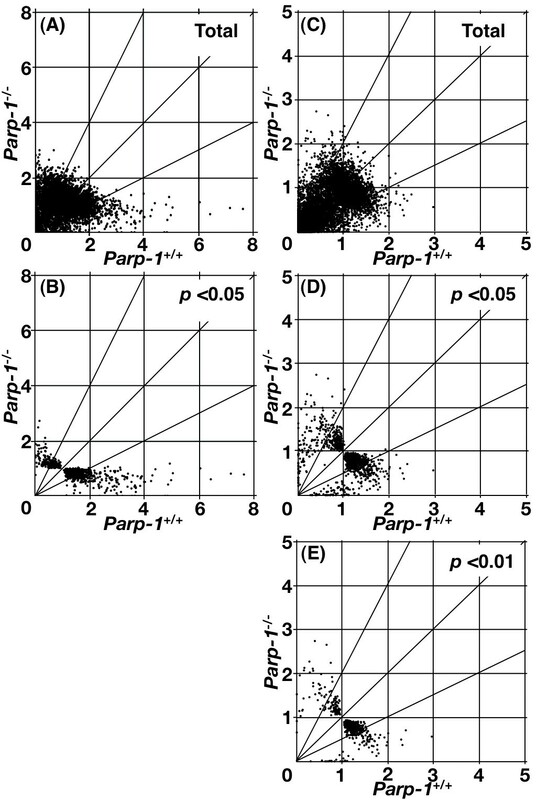 In the case of Parp-1-/- ES cells, 6 replicates consisting of triplicate microarray results from two Parp-1-/- ES cell lines were used. We used the triplicate microarray results from the Parp-1+/+ ES cell line, J1. We excluded genes that showed a standard deviation greater than 2.0 in the normalized data of both genotypes, and we started analysis with 9,640 genes and ESTs for ES cells (Table 1 (corrected)). We constructed gene lists only with the genes that showed statistical differences (p < 0.05) and 2-fold or greater differences in normalized expression levels between Parp-1 genotypes. To construct heatmaps, we used GeneSpring® GX ver. 7.3.1 (the latest version). We regret that this error occurred in the phase of generating the data set in our paper may have caused any inconvenience. In the process of making these corrections, the microarray data were submitted to the gene expression database CIBEX  with the following accession number: CBX22.